The review of the activities During the Past Year. Scroll Down for Previous Year's Reviews. 1) Chilly Willy Run: Starting from Willowbrook Garden Centre and finishing for lunch at the Golden Cross, well supported with our friends from other local natters. 2) Skittles Evening: The first of 2, this one held at Binton Social Club. A full house and we had 2 Danes in charge of 'putting-up' the skittles. As usual the 'Boys' triumphed and the highest score was by Roger Phipp. David Smith took the men's runner up prize. Although Pam was a clear winner for the ladies a playoff was required for the runner up eventually won by Julia Cleobury. We closed with the usual game of Killer and Caroline Phipp went away with the honours. Lots of people were vying for the 'Wooden Spoon' but I was presented with the trophy by Jane who was very pleased to pass it on. 3) March Club Night - Stuart Turner Talk: I was very pleased that Stuart accepted my invitation to give us a talk about his life in motorsport. He lead the 'Comps' department in Abingdon through their glory years and moved to Ford where he had similar success, a great evening enjoyed by over 50 of us. 4) April Foolery Run: As the last week-end of March was set as Mothering Sunday the March Madness Run was moved to April and Alan and the 'Team' laid on a good run starting at the Stratford Garden Centre and having lunch in Gaydon at the Malt Shovel. It was a good day to choose as the weather was kind with the sun shining. 5) Malvern Festival of Transport: A successful day for the Club with Nigel Hook winning the 'Best Car of the Show' award but Steve Entwistle was a runner up in the Modern category. 6) Drive-it-Day Run: Starting from Bonds just outside Stratford, we had a great display in the sunshine before setting off on the scenic run to Wroxal Abbey where we enjoyed a beer tasting session followed by a fine lunch. Grant who runs the hotel (and is a Magnette owner) gave us a tour of the church and a brief history of the Abbey, very interesting. 7) Chilly Willy WARMER Run: As New Year's Day was so cold and dull Graham suggested we have a re-run when the weather was warmer, so we had a repeat in May and it was well worth it. Although there was a shower when we were at the Willowbrook start, by the time we arrived at the Golden Cross the clouds had disappeared and the day was bright & WARM!! 8) Stratford Races Day: Nigel was the leader for this great day out, having arranged a dedicated parking area near the entrance he then gave us a tour. Starting with walking the course and checking 'the going', then measuring up the fences. Was followed by a walk through the changing rooms, then the weighing room before inspecting the stables and warm up ring. I don't think anyone lost too much!!! 9) Gaydon Festival of Transport: We had a prime position outside the main entrance to the Museum for this show, including plenty of space to put up one of the shelters, ideal to keep the sun off!! 10) St Audries Bay Week-end Away: This was the first week-end away the Club has organised and we are thankful to Nigel who arranged the whole thing. After meeting up for dinner on the Friday evening, Saturday was a run over to Dulverton, with a stop for lunch in one of the many pubs before the run back through Dunster (no relation!!). Sunday was left free for everyone to choose their own activity and lots went back into Dunster to see the Castle. We did manage to get us all lined up on the green for the photo shoot, including the drone video. It's a shame the weather was not kinder to us but there was plenty of dry spells for us all to enjoy the week-end, so much that it's all booked again for next year. 11) The Last Heritage Run: I think we went out on a high note with a great run, a great venue, great weather and a great day enjoyed by the largest entry for many years. It was definitely a good way to close a very successful series of events. 12) Show Night: This was brought forward by a month into July which seamed to work well with the Orchard Car Park overflowing. Lots of votes were cast and the girls did a sterling job of collating the results. Best MG went to Mike Storey's MGA, first runner-up Ken Aiton MGA Coupe and second runner-up Helen Lobb-Jones's TC. Best 'Open MG' was Mike Brown's YT and runner-up Graham Smith's TF Twin Cam. Best 'Closed MG' went to Alan Cleobury's Magnette, with Sue Melville-Smith's YT the runner-up. The final category was the 'Tidiest Boot' which was awarded to Norman Large's B Roadster. As this was American Independence Day a special award was presented to Graham Reeves's beautiful Ford Mustang. 13) Cheltenham Fryer: Not technically our event but a good number of us joined our friends from Bromsgrove aboard the GWR Steam Train for a fish & chip supper on route back from Cheltenham. 14) Joint Natter: Although this went to the same venue as the last few years there was a good turn out for the run over to Severn Stoke but I must redo the route instructions if we go to the same pub next time! 15) Badsey Flower Show: A good turnout for this show despite the heavy rain during the day but enjoyed non the less and the Spitfire made it's usual appearance for a short flying display. 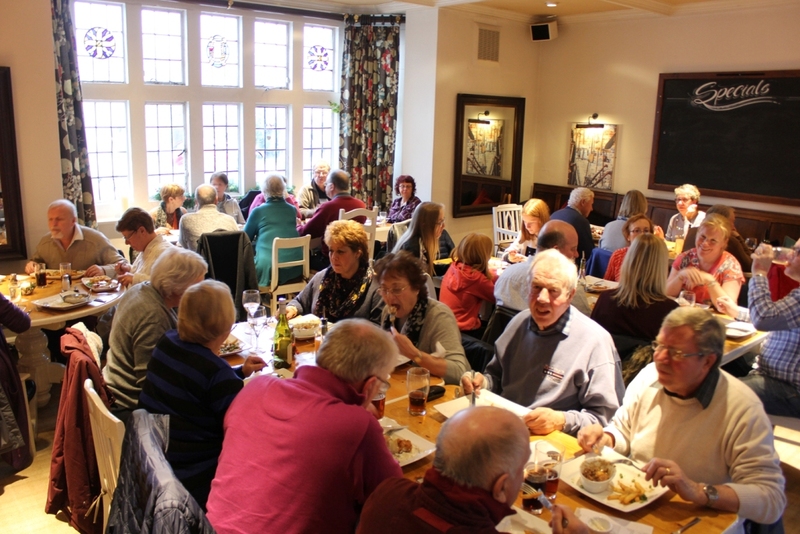 16) Quiz on Wheelz: Mike & Jane did a grand job for the quiz, with a full house in the private dinning room we had for the Chinese taster meal after the run at the Wheatsheaf Inn in Badsey. For the main quiz Graham & Fiona Robson were the winners and have agreed to set the next Q on W but there was also a second quiz in the pub from observations on the route (I'm still not convinced about the 365 sheep in the field but Rule 1 still applies) and Peter & Julia Grice were the most observant. 17) Chairman's Picnic: Starting from our usual venue of the Golden Cross it was a very scenic run over to the Batsford Falconry Centre where the 'team' had laid out the storm shelters and tables ready for the picnic food. The weather was again kind to us with the sun warming us despite the biting wind. The bird's flying display was great and most of us went back for a second demonstration, after another helping picnic food. 18) Brailes Show: This is always a well attend show and this year was no different and we filled our normal corner with MG cars. The storm shelter again came into good use to protect us all from the sun and there was lots to see in the show. 19) Pershore Plum Festival: Finally we got a fine day for this event with the storm shelter being used as a sun shield again, we even had a 'double' line up of cars in our usual spot in front of the Abbey. 20) GWR Presentation: As a memorial for the Heritage Run we sponsored the building of a Memorial Retreat at Toddington Station of the Gloucester Warwickshire Railway. To celebrate the official opening of the 'Retreat' we were invited to the station to attend the ceremony and enjoy a trip to Cheltenham on board the steam train. This attracted a good display of MG cars at the trackside and a good crowd for the cutting of the ribbon by Heritage Run Committee Chairman Richard Workman. 21) Club Night - Shakespeare Hospice Cheque Presentation: The clubs funds had grown to an extent that we could make some charitable donations and after the votes were counted the Hospice was everyone's favourite and we invited their fundraiser Nicola Edwards to give us a presentation about the work they do and accept our cheque. 22) Alcester Day Care Presentation: This was the second charity we voted to donate to and we assembled 2 cars outside their centre to make the cheque presentation. The cars were much admired by passers by and the visitors to the centre a great talking point for the rest of the session. 23) Malvern Autumn Show: Set in the base of the Malvern Hills we had a good long line of MGs and again the storm shelter was put to good use. 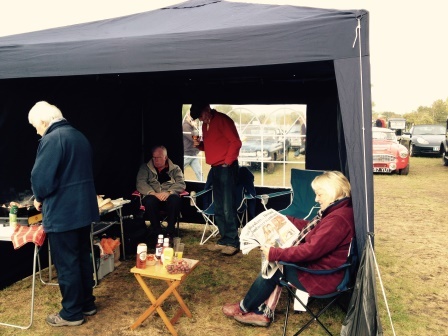 Alan and the 'Team' did a great job cooking bacon rolls for everyone and lots of interesting cars to see in the showground, although no one went into the competition this time. 24) British Motor Heritage Factory Tour: As a working factory these tours can only take place mid week but Richard Avery had no problem in filling the 15 spaces for the tour and they all enjoyed seeing the 'Heritage' body shells coming to life. A good lunch was enjoyed after the tour. 25) Skittles Evening - Autumn: A second bout of skittles this year with this competition being organised by Nigel Hook, who was very keen for us to go back to the Butchers Arms in Mickleton and yet again we had a full house to join in the games and enjoy the food. This time the tables were turned and the girls easily beat the boys, however Tony Barr was the highest scorer over the 2 rounds. The evening finished as ever with the game of Killer and Caroline Phipp managed to hold her nerve to be the winner for the second time this year. 26) Club Night - Quiz: Thanks again to Nigel for arranging another of his now famous Quizzes. There was a good selection of questions giving everyone a chance to have an input. David Harrison and his team were the winners this time, well done. 27) Xmas Meal: Our final event of the year saw the restaurant overflowing into the bar area again, with over 50 of us enjoying a very good Xmas meal at the Golden Cross. As ever every couple went home with a prize from the draw. It was great to see so many folk getting dressed for the occasion with several 'Elves' and lots of Xmas Jumpers. A great end to the year for the Club, well done to everyone. Again it has been another good year for the club with many events organised, more of which later but more importantly the monthly club nights continue to be well supported, no doubt everyone is encouraged by the bowls of chips provided by Debbie on club nights. The statistics for the year show we have 115 people on the 'Database' of which 9 were new in 2014 and 72 were active (i.e attended at least 1 event/activity during the year). The events with the largest attendance were the 'Show Night' in August when 38 cars filled the orchard car park at the Cross and 61 people voted and the Xmas meal when 48 people sat down to dine. Golden Cross to Batsford Arboretum, despite the poor conditions we had 17 cars assemble at the Golden Cross and 8 of those were MGs, including an MG Maestro, 2 MGB GTs, an MG Midget and an MG TF Midget. Most of the route was OK but there were a few 'puddles' after passing Broadway Tower. When we arrived at Batsford Arboretum it was so wet entry to the Arboretum itself was closed but we all enjoyed the refreshments in the café, which we had to ourselves. 30 people took part in the 'Quiz' at the February Club Night. 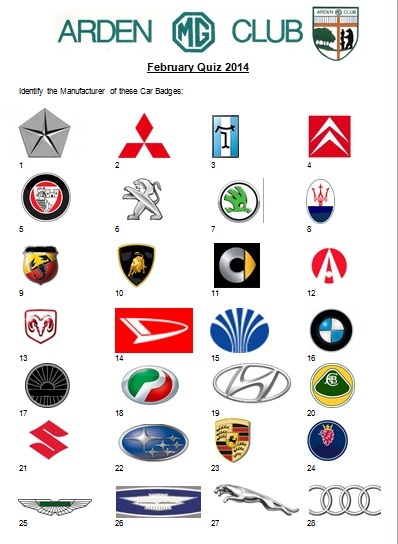 The quiz was all pictures, the first half being car manufacturer's logos and the second half photos of 'celebs' and motoring people. All the celebs were taken from the Xmas TV Guides, so were current, although the motoring people caused the most trouble!! After marking there were 3 teams tied with 46 points but Allen Smith finally came up with the answer to the tie break question, one of the other names of Colin Chapman (Anthony Colin Bruce Chapman). Ron gave us an interesting talk about his career as a Pilot & Captain with British Airways for 30 years, although the discussions about air crashes might have disturbed some of the full room at the Cross. 15 of us eventually arrived at the factory most of us having difficulties finding the factory as the address is not quite where they are situated! After coffee and biscuits we were given a short talk about the history of BMH, how they were formed by BL Heritage along with BMIHT Gaydon but were sold off when under the ownership of BMW to a private consortium and is now under the leadership of John Yea. We were then guided into the factory and allowed to roam and talk to the guys on the shop floor, the visit had been planned to coincide with the production of MGB bodyshells but we were also able to see an almost finished E-Type Jaguar bonnet. 30 of us assembled at the Masons Arms in Long Marston all set for the competition. The now traditional game of 'Boys' against the 'Girls' was followed by the hot supper. We ran out of rice but the landlord soon provided us with a giant bowl of piping hot chips. After supper it was back to skittling, rounding off the evening with a game of Killer. This resulted in a fine tussle between David & Alison Smith, with Alison holding her nerve to take the bottle of wine (I hear it was very quiet in the car going home!!!). Again the 'Boys' took the honours with an average score of 22.7 points against the 'Girls' 22.5. The best Lady prize went to Jill Workman with 28 points, the highest scoring man was myself, also with 28 points. Diane Rayner was very keen to pass the wooden spoon on to someone else and Leslie Gunde was this year's recipient (I was glad to see he had hung the fluffy dice onto his rear-view mirror in the MGF). 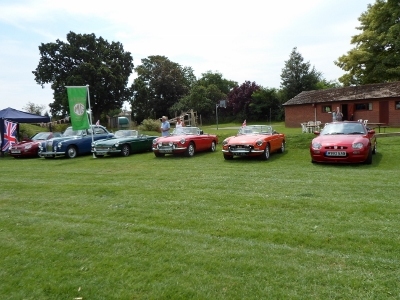 There were 5 cars attending from Arden MG, looks like the breakfast was good. Starting as usual from the Golden Cross but it was an inspired decision to bring the date forward by a week as the weather was fantastic with the sun shining all day. When everyone (well almost everyone) had gathered their cars into the Courtyard at Wroxall Abbey we had a photo shoot and this group photo was the background for this year's Heritage Run Rally Plate and route book Front Cover. The scenic route was set by Mike & Jane Green (and a great job they did too), however Mike was somewhat disappointed that the weather had dried up as much as it did and was not able to award the prize for the Dirtiest car to arrive at Wroxall Abbey after the state his cars got into checking out the roads beforehand! Thanks to Mike & Jane, I think they are talking to each other again! 20+ cars enjoyed a very scenic run, many thanks to Richard Workman for setting the route and supplying the informative comments about things along the journey. There was a slight problem at the Gate Hangs High with insufficient tables available for those that wanted to have lunch. My apologies for this but I did advise the landlord of the expected numbers and he made no comment that he would be short of space and booking would be advisable. I will arrange things differently for the next run. HMC, Gaydon to Nat Mem Arboretum. All the comments we received about the run were good, so well done to the committee for another well organised run, helped by the sunshine. It was good to take the 'Run' in a different direction along roads we have not used before and I think it surprised some people how close to Coventry we were but still in beautiful countryside. I hope everyone noticed the memorial in Meriden signifying the Centre of the Country. On arrival at the National Memorial Arboretum we had a vast area to park-up and spread out for picnics. I had my first go at erecting the modified Club Flag, which looked good but did take 3 of us!!! At the allotted hour the convoy formed ready to drive into the Arboretum where we parked among the trees on one of the Avenues, which was much appreciated by visitors to the Arboretum. A brilliant day, thanks to all concerned. 7 cars enjoyed the run down in the sunshine for a pleasant day. Won by Caroline and myself. The 8 or so teams enjoyed the run on a fine evening, which ended at the Kings Arms in Mickleton, a big thank you to Graham & Fiona for organising the Quiz. 4 cars enjoyed the run over to Malvern to join in the fun and were entertained by a Folk Band. 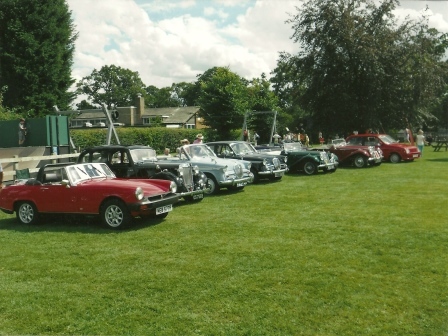 6 cars attended this show, lined up under the club flag. A fantastic turn-out for the 'Show Night', thanks to everyone who attended and voted but a special thanks (which I forgot on the night) to the 'Girls' Pam & Caroline for collecting the voting slips and recording the votes to establish our winners and to Graham Robson for taking the photos. 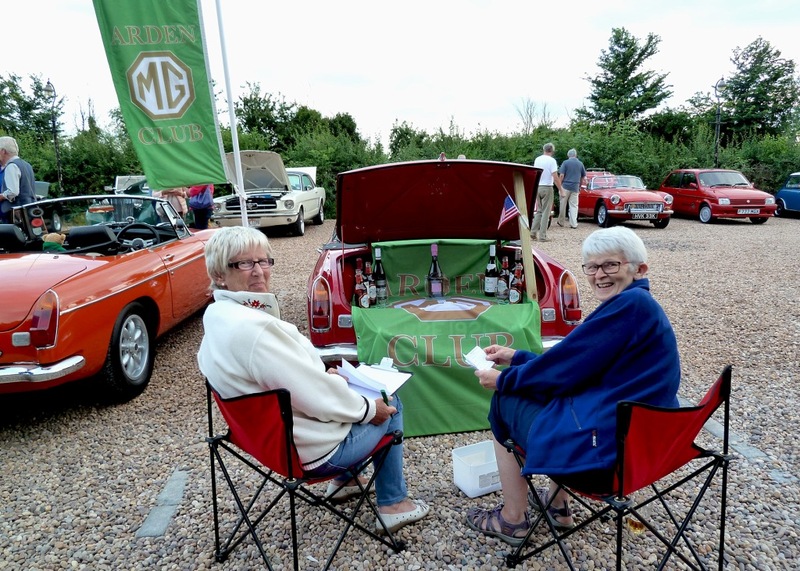 I hope you all saw the selection of prizes which included a new award for the 'Best Car' and an award for the best 'Closed' car which was kindly donated by MG Motors, although they were not able to attend this year. The prize for the 'Best Car' was a meal for 2 at the Golden Cross thanks to the generosity of Debbie. It was also a special birthday for Gaynor and I hope she wasn't too disappointed spend it with us all! A great evening filling the orchard with MGs. At least 2 cars on a fine day. Rain of biblical proportions didn't stop 6 cars meeting at the Cross for a scenic drive over to Pershore Abbey Grounds, however attendance was a little down on previous years, with most of the cars having their roofs up and Alan's gazebo was very useful to keep the torrential rain off for our picnics. Thanks to Doug for this one, clearly won by David Harrison's team. There was lots of comments and banter flying around the room, so it must have been enjoyed by everyone. A small display of 4 cars but I'm told the bacon butties and Old Speckled Hen were especially good. Roger Clarke was on the rally and when offered the army rations (David was a member of the Royal Artillery) he opted for Steak & Kidney Pie for every day for the run to Bombay, which took 6 days! They would be eaten cold as his Cortina was not fitted with a heater! David was overtaken by Rosemary Smith on a special stage after about 20 minutes, from 3 places behind (6 minutes gap). He tried but just could not keep up with her! Later in the rally Rosemary had a problem with the engine in her Cortina, so David had to stop and tow her car all the way across Afghanistan to the next service point, without anyone reporting them, as assistance was not allowed. Despite a serious 'off into a ditch' which required the axle to be pulled back into place with a tractor David went on to finish the event as the 2nd Ford works car (out of 6 starters) and 30th overall. Well done. Many thanks to David for gathering his photos and information together for us all to enjoy. He also went on to finish the following Marathons in 1977 and again in 1993! The Xmas Meal, on the usual December Club Night, went down well, the final number was 48 after a couple of last minute cancellations (which we will be able to refund) due to health problems. Roger, ably assisted by Helen & Mike did us proud with the raffle, everyone got a prize, so a big thank you to them for the hard work for the meal and all through the year (it's the monthly raffle that puts some funds into the Club, allowing us to finance any expenditure). As always Debbie provided us all with an excellent meal (I did not receive any adverse comments from anyone) and we had some very well dressed diners. I would like to give a big thanks to Helen & Mike who organise the monthly raffle which pays for any expenditure we need to make. Can I also thank all the officials; David for keeping the database and all this year has kept a register of attendants at events, Roger for keeping control of the money and preparing the accounts, Alan for adding new events and keeping tabs on events and their entrants, Lech for keeping us up to date with goings on at the Car Club and Richard for stepping into the breach as Chairmanship of the Heritage Run Committee. Lastly, can I remind everyone that despite all my holidays I only missed 2 club nights, Caroline is very accommodating arranging our trips abroad, around club events! !